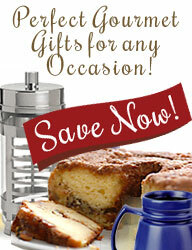 Gift Baskets, Tea Time, Coffee Time, For Him, Chocolate Bliss, Cake Lovers and more! "your "customer service" is incredible. Very rare these days. Many, many thanks." We listened! Our customers told us we had great gourmet gifts and have asked us to put them in gourmet gift baskets so they could send them as gifts and corporate gifts. We have listened, please check back as we continue to create creative gift baskets for our customers to enjoy, and don't hesitate to share your ideas for gift baskets you would like to see us carry! Happy gift giving! Our Gift Basket Department will make to order gift baskets at any price point you desire, so if you don't see what you want, please call us anytime 1-800-804-8997 and ask for your Personal Gift Basket Specialist! ** Due to fluctuations in our inventory we reserve the right to substitute alternate gourmet gift items in our gift baskets if necessary. If, after taking your order, a particular item becomes unavailable, we will substitute it with one of our other gourmet items of equal or greater value.